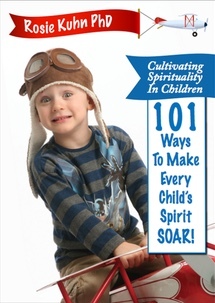 If you are a grownup in search of a book that empowers you to contribute to your children’s spirituality, and at the same time may be a catalyst for your own spiritual journey, then this book is for you! Cultivating Spirituality in Children… is for grownups who are interested in instilling spiritual values and practices in children – enough that they notice the words they speak and the actions they take, and ask themselves: Are my words and my actions in alignment with what I want for my children? Am I willing to take on practices that will to not only cultivate awareness in me, but also shift my thoughts, my words and my actions, so they are in alignment with, and integral to my highest values and my highest contribution towards my children’s well-being? The title of this book will have you expect to be reading about children and what they need in order to develop many of the spiritual competencies that we conscious parents and grandparents want them to have. However, until we grownups cultivate those competencies within ourselves, our children won’t believe a word we say. They intuitively know when we are not practicing what we preach, because, our actions always speak louder than our words. Theoretically, spirituality is the cultivation of a deep and authentic relationship with our Divinity – our creator and all of creation. It is a process of revealing the ever present, ever deeper and richer layers of our unity – our oneness with all that is. This Divinity is the life force within all beings, and can only be fully known through direct, personal experience. Only through applied dedication can one begin to curiously explore, experiment, and discover the truest relationship with Self. All religions and spiritual traditions provide principles and practices through which we elevate awareness and empower ourselves to live consciously. Our journey towards re-membering and integrating with our spirituality requires each of us to intentionally find and claim our own unique relationship with Spirit. Then, and only then can each us actualize our fullest expression of the Divine through our Being. 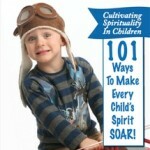 What the Heck Is So Important About Spirituality And Children? Children enter the world already having a spiritual life. They are spiritual beings who, just a short time ago, adventured into the world of human beings. They still have access to the wisdom and wonder of the world from which they came; they still have relationships with those whom, to us, are the unseens: angels and friends with whom they speak. Innately, they have the competencies to be naturally connected with the spiritual world, until they become more like the rest of us, and begin to forget their essential nature as spirit beings. Children often struggle with what things mean here on Earth, and how to make sense of the consensus view of the reality, where they now exist. Even though the world won’t make sense to them for a long time, if ever, their deep, innate sense of compassion and love is always forthcoming. Experts in the field of children’s spirituality say that we adults need to be open to learning from children about how to live life, for they have access to a spirituality that for many of us is long forgotten. In Service to Beginning My Spiritual Journey… I’m not sure what I believe about God, my higher power, Universal Source of all that is, Oneness. Whatever it is called, I can’t wrap my head around it enough to figure out how to engage with it. However, by practicing observing how I be in my life, I’ll be able to discern the priority of my values. Perhaps this will be the beginning of my spiritual journey. In Service to Cultivating Peace… Coming home after a hard day at work, I find myself irritated with the amount of noise and commotion generated by my children. I watch myself get irritated enough that they disappear into further reaches of the house, avoiding me and my tirades. This is how I think I create peace for myself. Although it may create “peace,” it isn’t creating the kind of peace I’m wanting to really enjoy with my family.I know that I am responsible for creating this family and all of the chaos that comes with family. I know that there is another way to be that allows everyone to feel free to be themselves while respecting other people and their needs. As a practice, I can notice when I’m using irritation as a way to push people away in order to find my “peace.”I practice seeing how my irritation is based on a desire to avoid connection – the very reason why I chose to have a family in the first place. I practice stretching my ability to be present to my family in a way that allows me to enjoy the way that it is. When I need solitude and peace, I can ask for it in a way that doesn’t push my children away, but creates respectful acceptance for all that is within a family. In Service to Truth and Humility… When I make a mistake and then I tell a lie about it, I dishonor myself and the people I am lying to. When I practice telling the truth about my mistakes, I discover and begin to experience who I am in my humanness. I can then humbly acknowledge that I am not beyond failing to be perfect. In Service to Trusting Myself… Before I can truly trust others, I have to trust that I can trust myself. As I practice noticing when I trust others over myself, I gain opportunities to trust myself instead. I practice deferring to no one outside of me and honoring my innate knowing. In Service to Developing a Relationship with the Inner ME… My sense of Self is founded on how I experience myself, not on how others experience me.Developing a relationship with the inner ME requires the practice of making time to be with my Self; it cannot happen any other way. By engaging in this practice, not only am I getting to know myself, but I am also cultivating self-appreciation and self-respect. I LOVE your new book. Congratulations!!! on such a needed body of wisdom!